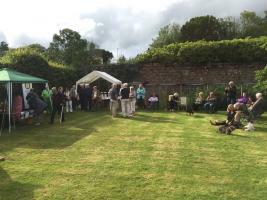 Rotary Club of Cumnock - welcome! Please scroll/swipe down through this page to find out more about us, in addition to the pages linked in the menu, top-left. 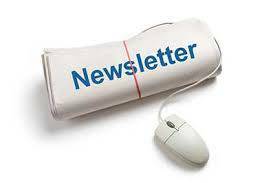 We welcome visits from other Rotary Clubs and Rotarians visiting the town, please feel free to call into our meeting at the Royal Hotel, The Square, Cumnock on any Tuesday night at 6.00pm for 6.30pm where you will be made most welcome. Cumnock, with a population of 9280, is where the the A70 from Edinburgh to Ayr. meets the A76 from Dumfries to Kilmarnock, though since 1992 the latter has bypassed the town to the west. Although much older in origin, Cumnock looks and feels Victorian, and the area still has a sense of an industrial past now largely departed. This part of East Ayrshire grew dramatically in importance during the 1800s with the discovery of ironstone and coal. From 1866 the small village of Lugar, a mile or so to the east of Cumnock, saw the establishment of the Lugar Ironworks, a huge plant that eventually grew to support five blast furnaces. The Lugar Ironworks was linked by a network of narrow gauge rail lines to surrounding coal and ironstone mining villages. Cumnock became the focal point of a large part of Ayrshire, well served by rail links to Glasgow, Dumfries, C arlisle and Ayr. 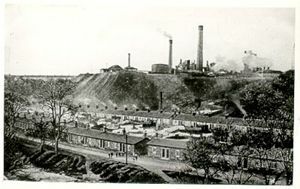 The ironworks at Lugar failed to reopen after the General Strike in 1926, but deep coal mining continued into the 1960s and 1970s. Today the only coal extraction is from open cast mines in the area. The railway line to Ayr has long closed, and while the main line still passes to the east of Cumnock, the town lost its station in 1965. As well as coal and iron, Cumnock has seen a number of more unexpected industries flourish, and in some cases die. 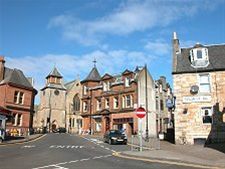 In the early 1800s the town became famous as the home of Cumnock snuff boxes. 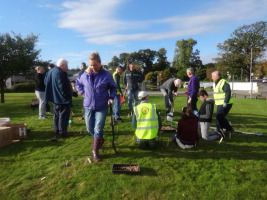 Up to 100 people in Cumnock worked on these small plane-tree wood boxes, complete with their decorative lids and fine concealed hinges. In 1964 a shoe factory opened in Cumnock capable of making a million pairs each year, and in the late 1970s Stonefield Vehicles, a manufacturer of all terrain vehicles, briefly set up an assembly plant here. In the early 1990s a company called Emergency One was set up to produce fire engines. Cumnock itself has benefited by the A76 bypass, and the A70 also skirts the very centre of the town. The central area focuses on the Square in which you find the beautiful honey coloured stone Old Church, built in 1867. The original design envisaged a spire: in many ways the end result is more pleasing with the small tower it was given instead. 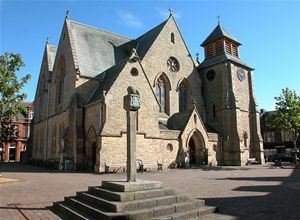 The Square is also home to Cumnock's Mercat Cross, dating back to 1703. The Sun Inn and the range of buildings on the south side of the Square also date back to the 1700s, giving the centre of the town a sense of its real antiquity. 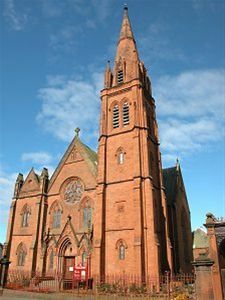 South of the Square is Cumnock Trinity Church (formerly Crichton West Church), built in 1899. This very definitely does have a spire, which like the rest of the church is built in a startlingly reddish-orange stone. This same stone crops up elsewhere in Cumnock, most notably in the functional but good looking Town Hall on Glaisnock Street which dates back to 1885. 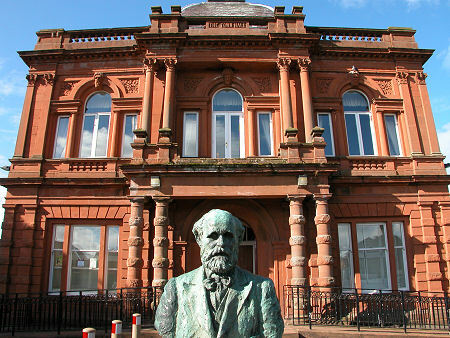 In front of it is a bust of James Keir Hardie who worked as a journalist in Cumnock. In 1888 he founded the Scottish Labour Party and went on to become Independent Labour MP for West Ham in London and later for Merthyr Tydfil in Wales. He died in 1915. Speaker, DJ Douglas - "Laurel & Hardy Links with Scotland"